We had our bathroom fully renovated and we are very happy with the finished job. Fred and his boys were very professional and also friendly and polite. Everything was done on time and to budget as well as extra’s that needed to be done because of unexpected white ant damage. They guys always cleaned up after themselves at the end of each day so we weren’t left with to much inconvenience during the process. 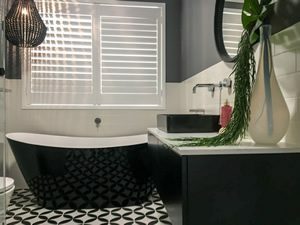 I would highly recommend Master Bathrooms to anyone looking to have a new bathroom installed or their exsiting bathroom renovated.